"Hakuganshi" was published by Ushio Shuppansha on December 5, 2000. The story begins at a market place in Otaru, in 1946 October. Otaru is in Hokkaido, which is the northernmost prefecture in Japan. When Mitsuko is waiting for her relatives, she sees a man and she runs away from him being scared. Going far away from the market place, where her relatives told her to wait until they return, she feels desperate. She is four or five years old and her relatives won't be able to find her unless she stays in the market. When Mitsuko is shivering in the first snow, some people come to take her to White Eyes' place. White Eyes(Hakuganshi) was the one that Mitsuko saw in the market and ran away from. Mitsuko begins to live with White Eyes and his elder sister, Kayo. White Eyes has a magical power. Many people visit him to ask if their family who went to the war is still alive or not. Mitsuko guides them to a hall where White Eyes tells fortune. Visitors hand their family's photo or possessions to Mitsuko, and Mitsuko passes them to White Eyes. Even though White Eyes is blind, he can tell the fortune if he takes a look at them. White Eyes loves plants and he takes care of flowers in the garden. 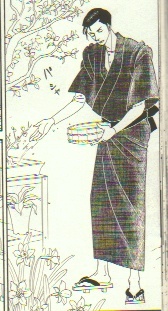 When Mitshuko breaks a flower off, White Eyes tells her to use scissors when cutting flowers. "You can see!" shouts Mitsuko. "The broken flower smells." shouts back Kayo. Mitsuko wonders how he knows Mitsuko is in the garden. One day, an old lady asks White Eyes to pray for her granddaughter's health. 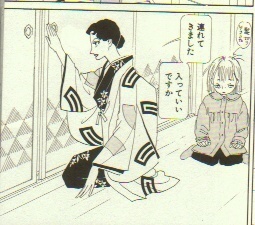 Staying in the hall while White Eyes is praying, Mitsuko feels worse and worse. She gets measles. Suffering in the night, Mitsuko hears someone call her name. She feels something cold on her forehead. She had thought Kayo is putting a cold towel on her forehead. But it's not Kayo or a towel. White Eyes keeps positioning his hand just above Mitshuko's forehead. When Mitsuko is a primary school student, a couple calls on White Eyes. Their son died in the war and recently both of them dream of him every night. They think their son might have something to tell them and they want to know what he wants to say. White Eyes and the father sleep in the same room. White Eyes tells him to hold White Eyes's hand and think about the son. An hour after, they wake up. The father says he saw his son. White Eyes gets exhausted after that. Eight years after Mitsuko met White Eyes in the market in Otaru, they move to a small house in Sapporo because Kayo's patron has gone bankrupt. 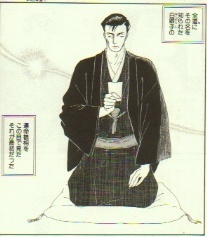 Kayo's patron is a black market trader. He has failed in the stock market. He wanted White Eyes to tell the business fortune, but White Eyes said he wasn't able to tell about the business. One day, a visitor comes to ask White Eyes to let him see his late mother. White Eyes sleeps in the same room with him to let him see his mother. After that, White Eyes gets exhausted and falls asleep. White Eyes, Kayo and Mitsuko sleep in the same room because their new house has only one bedroom. After going to bed that night, Mitsuko sees something strange in the ceiling. The ceiling doesn't have a hole, but it seems as if there was a round space in the ceiling just above the place where White Eyes is sleeping. Mitsuko murmurs "What's that?" "Don't think about it." says Kayo. Mitsuko is surprised because she had thought Kayo is sleeping. Kayo gets a new patron and they move to a bigger house. He is an entrepreneur who deals with dairy product. Even though Kayo wants White Eyes to tell something about his business, he says he isn't able to tell if someone gets a profit or not. He also says Kayo's patron leads a charmed life. Mitsuko asks White Eyes how he knows someone is lucky or not. She is interested because a 16-year-old pretty girl has become famous because of her magical power. "It's better for you not to know how. I have this power in exchange for my eyesight. " says White Eyes. Mitsuko thinks "but she can see things". "Someone who has a magical power and doesn't seem to lose anything in exchange now will lose something in the future." says White Eyes. He says it seems to him that everyone has the same amount of happiness and unhappiness. Mitsuko can't agree with him. She thinks it often happens that some people have been happy all their life and some others have been always unhappy. Mitsuko is unhappy with her face. Her face has three moles in a line. Kayo says "Shiro-san(White Eyes) said they show a bad luck." And She puts powder on Mitsuko's face to hide the moles. "Mitsuko's ok. You don't have to do that. "says White Eyes. Kayo's patron has expanded his business and it goes very well. But one day he is stabbed by his daughter to death. When Mitsuko is 17, her cousin Satoko calls on her. Mitsuko remembers her face. Satoko was the one who told Mitsuko to wait in the market. She states Mitsuko's real name is Michiko. Mitsuko's parents had died in the air raid. When Satoko and her brothers were taking Mitsuko to their grandparents' place, they got lost. Satoko told Mitsuko to wait in the market and she and her brothers looked for their grandparents' place. When they returned, they found Mitsuko nowhere. Having regretted she had left Mitsuko in the market alone, Satoko cried and cried. One of Satoko's neighbors showed her a photo recently. Satoko recognized Mitsuko in the photo because of the three moles. Satoko says their grandmother is still alive and she wants to see Mitsuko. Mitsuko calls on her grandmother in Hakodate. Even though Mitsuko is thinking of going back to live with White Eyes and Kayo, Mitsuko's grandmother wouldn't allow her to go back. Mitsuko sends a letter to White Eyes and Kayo. There's no reply to it. Mitsuko sends some more letters, but they return because of the wrong address. Mitsuko feels sad. Her cousin Masao soothes her. When Mitsuko is 21, she gets married to Masao. She wants to invite White Eyes to her wedding ceremony. Satoko disagrees. She says White Eyes asked Mitsuko's family for a great amount of money. Mitsuko can't believe it. Mitsuko and Masao start their new life in Yokohama. Masao is a sailor. When Mitsuko is pregnant with the first baby, the boat that Masao is on is missing. Mitsuko is so shocked that she almost miscarries. She has a nightmare in a bed in a hospital and wakes up. White Eyes is standing beside the bed. He says "Don't worry, Mitsuko. Your husband will come back on August 26." Masao is saved in the Pacific on August 26. Mitsuko gives birth to a baby girl and names her Mitsuko. She wants to see White Eyes again, but she gets pregnant again the next year and she can't have time to go back to Hokkaidou. When Mitsuko is 27, Masao dies in the shipwreck. Mitsuko goes back to Hakodate and starts working for Satoko's brother. One day, Satoko gives her a call. Satoko tells her to read a newspater ad, which looks for Mitsuko. Kayo is searching for her. Mitsuko meets Kayo for the first time in 12 years. White Eyes has cancer and he is hospitalized in Tomakomai. When Mitsuko goes into the room where White Eyes is laying, he is aware of her immediately. Outside the room, Kayo and Mitsuko talks a lot about what happened in these 12 years. Kayo says Mitsuko's family sent them money after Mitsuko went back to her family. Kayo and White Eyes were surprised and they sent the money back immediately. Then Mitsuko's family misunderstood that Kayo and White Eyes wanted more money. In the meantime, Kayo and White Eyes moved house and they lost contact with Mitsuko. Kayo and White Eyes missed Mitsuko a lot. Mitsuko only has a day off and she has to return home on the day. She has a question that she wants White Eyes to answer by all means. White Eyes looks asleep and Mitsuko hesitates to wake him up. To her surprise, White Eyes says "Do you want something to ask me?" Mitsuko tells him he went to see her and he told her Masao would come back on August 26. White Eyes looks surprised to hear that. He says "I'm happy I was of help to you. I'll keep August 26 in mind." According to him, the past, the present and the future exist at the same time in another world. People can go to any time that they want if the desire is strong enough. Most miracles happen in this way. "I'll be visiting you at that time after I die." Says White Eyes. Mitsuko cries "Don't say you die" and bursts into tears. White Eyes says, "Don't cry. I'm happy I can see you after I die. I've never told it anyone, but my eyes can see you. I can see most flowers and grasses, dogs and cats, too. You are the only person that I can see. " Mitsuko can't get what he says. White Eyes says, "I can't see things as you do. They radiate a glow and I can sense the glow. I was very happy when I found you in the market in Otaru. I can't see even my sister. I enjoyed seeing you radiate a strong glow when you were energetic and a feeble glow when you are sad. I don't know why you are the only person that I can see. You radiate a stable glow now. You've grown up. Trial makes people strong. Many people have visited me to avoid a bad luck. I've made every effort for them but I was only able to change a minor bad luck to a minor good luck. However, people shouldn't try to avoid every bad luck. A bad luck sometimes comes to you. It's more important how to receive it than how to avoid it. If you want more than enough happiness, a small bad luck come back to you as a huge bad luck." Mitsuko asks "Is it because everyone has the same amount of happiness and unhappiness? " "Exactly. You remember it. Will you do me a favor? Please support Kayo after I die. I couldn't do anything for her. I want her to become happy. How useless I am! I have to ask someone else to make my only sister happy." Says White Eyes. "No, you aren't! I watched you and the visitors many years. You saved them. It's amazing to change a minor bad luck to a minor good luck. You're great!" says Mitsuko. "Thank you Mitsuko." says White Eyes. White Eyes dies six months later. The first snow falls in Tomakomai on the day.